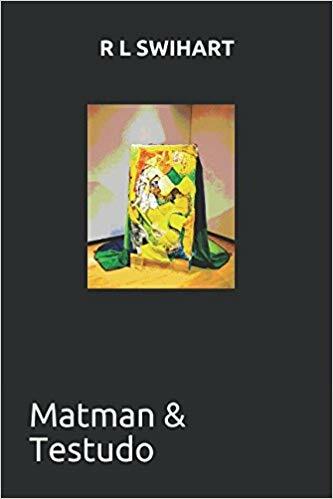 R L Swihart, Matman & Testudo, Gold Across the Water Books, 2018. (Available at Amazon both as a paperback and in Kindle format). stretch on the canal's white railing"
And it reminds us, too, of the odd name of Swihart's publisher (perhaps himself?) on the title page: Gold Across the Water Books. Everything converges, and accidentally, yet necessarily just by being here, it converges to the girl with the gecko tattoo. "Of course we are all seers. And blind to ourselves. flattened and all I could see was a straight line"
"Sam acted mildly interested in the topic, but insisted he knew more about angels than Teri. Said, so far as he knew, angels, no matter which way they turned, were always facing God"
That is knowing about angels alright, and about how we differ from angels, and that's why we are always and from the four corners being told: Look forward, ahead of you, to a brighter future, etc. Above all, don't live in the past. "Non, je ne regrette rien", as Edith Piaf used to sing, rolling her r's as no one else ever could. Swihart's book will richly repay your efforts. It's there, at Amazon. R.L. Swihart's first book was reviewed in Offcourse #50, https://www.albany.edu/offcourse/issue50/three_reviews_nirenberg.html. His poems have appeared many times in this journal. R. Nirenberg is editor of Offcourse.